Bridlington was the star of the show at the glittering regional premiere of the new Dad's Army film. The clocks were turned back to 1944 at The Spa Bridlington where the film's producer, director and Felicity Montagu, who played Mrs Mainwaring, took to the red carpet. The Spa was transformed with soldiers, war vehicles, posters, memorabilia and an Anderson shelter and producer Damian Jones told the Free Press "it was nice to come home". Mr Jones said: "It is absolutely great to see so many people turn out for the event. "You let us take over the Old Town which was very generous of you. Businesses were very cooperative during the three weeks of filming and more than double that for creating the set so we can't thank them all enough." 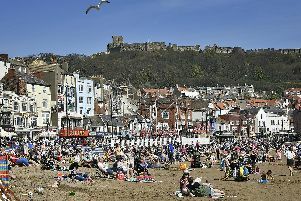 Bridlington Old Town was selected and transformed to become Walmington-on-Sea and, having seen the film on the big screen, the film bosses knew they had made the correct decision. "The film was better than we could ever have imagined and I can't think of anywhere else that would have been better suited," said Mr Jones. "We'd like to thank Screen Yorkshire for recommending Bridlington that turned into Walmington-on-Sea High Street. "We needed somewhere that was a beautiful seaside town and through Bridlington and the Bempton Cliffs, as well as many more, we brought the period to life."